Comments: The subtitle sums it up: “secrets of influence from the art of storytelling.” In the foreword, Doug Lipman says, “You will learn a thousand secrets for influencing others in lasting ways. And, like me, you will find yourself forever changed.” Contains valuable bibliography of books and articles. Comments: What a “springboard story” is and how it can transform an organization’s culture. In addition to examples of how storytelling worked, Denning also gives a valuable example of when storytelling didn’t work. And why. Bibliography. Comments: Resource for practical, “how-to” information. The title says it all. Comments: Good leaders have to be able to tell difficult stories. This book is for organizational leaders as well as lawyers, teachers, ministers, and human service professionals. Comments: Survival guide for gifted individuals who spend their days working beside Dilbert. Also a guide for leaders of these creative individuals. Wonderful collection of stories that worked (and didn’t work) in an organization. Categories: Leadership, Conflict Resolution, Training, Sales and Marketing. Comments: Good example of how a metaphor (story) can foster sustaining and transformational change. Involves Peter Senge’s books and ideas about systems thinking and the learning organization. Comments: Although written nearly a decade ago this small book looks through the eyes of a CEO at how to credibly use an organization’s everyday stories as a way to communicate values and expectations. Comments: The book is about human connections in an organization: trust, networks, and sense of community. The chapter, “Social Talk and Storytelling,” fits storytelling into this context and suggests ways to encourage the use of storytelling. Comments: Although academically written, this book provides a framework for categorizing and analyzing stories found in an organizational context. Comments: Stories are a fundamental part of the mediation process and in this book the authors dig below the surface to point out the archetypes and hidden meanings of conflict stories. Their conflict resolution model employs familiar fairy tale characters (Dragon ­ persecutor; Princess ­ victim; and Prince ­ rescuer) to provide a framework for solving organizational and individual conflicts in a way that preserves the relationship. Comments: While there are more recent books on using story in business organizations as a leadership communication tool, this easily readable and applicable book is still valuable. Neuhauser looks at the practicalities of employing story in various contexts, what constitutes a negative or positive story and the potential for story to be considered just so much more corporate propaganda among other relevant issues as well as provides wonderful examples to make her points. Author: Wacker, Mary B. and Silverman, Lori L.
Comments: This book provides the tips and stories that trainers and facilitators use to reinforce their points and bring learning lessons to life across such subjects as appreciating differences; leadership and problem solving. The authors also address what makes a training story; where stories come from; how to craft them and how to use them legally and ethically. This book also comes with a CD. The paperback version will be available in October 2004. Once Upon a Time When a meeting of the minds isn’t enough, try a meeting of the emotions: Tell a story. Comments: Overview of value of storytelling in an organization. Comments: Provides a rationale for using stories to convey goals and strategies rather than traditional presentations with bullet points. Comments: The author discusses the varying, often conflicting definitions of the term “organization vision” and provides examples of how to develop a clear vision story of the future within a business environment. Author: Hansen, Carol D. and Kahnweiler, William M.
Comments: This article discusses how by analyzing components of stories (heroes, villains, turning points etc.) of stories existing within workplaces researchers were able to see how top executives informally influence the work assumptions within their companies. The article also discusses implications for management education. Comments: This brief article demonstrates the use of story in a information technology environment. Service Provided: Helps organizations as a speaker, storyteller, facilitator for collaboration, and more. Service Provided: Full day of presentations. Categories: Vary from year to year. Tip: The best way to get an extensive and current list of sites is to type a phrase like “storytelling in organizations” into a search engine. 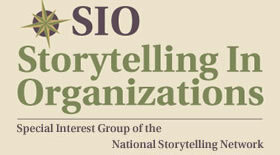 Here are a few specific sites with info on storytelling in organizations. Value/Info: Say It With a Story offers free articles and a free monthly e-zine that showcases story application throughout organizational life and numerous tried and true tales on over 20 organizational topics. Use stories to strengthen the impact of your communications at work and to get people to remember critical business information. Value/Info: Valuable site dedicated organizational storytelling. Has a bulletin board, list of local organizational storytelling groups, library, and calendar of events. Value/Info: Collection of articles and extensive collection of links related to storytelling in organizations, especially in more than one storytelling medium. Value/Info: Narrative psychology and storied conduct.